Kelly has achieved the status of Sandals & Beaches resorts Platinum Agent. Having experienced every Sandals & Beaches resort throughout the Caribbean, Kelly is well versed in the intricacies and features that make each resort a unique destination. Contact Travel by Kelly to begin planning your Sandals or Beaches vacation! Your perfect family getaway awaits you at Beaches all inclusive Resorts in Jamaica and Turks. Play on pristine, white-sand beaches caressed by crystal-clear seas. Spend your family vacation in luxurious rooms and suites. Enjoy a whole array of incredibly exciting and fun activities for kids of every age. Truly, Beaches Luxury Included® vacation package deals in Jamaica and Turks & Caicos promise unforgettable family fun beneath the Caribbean sun. A kaleidoscope of cultures from Britain to Bali awaits you at Sandals Royal Caribbean. The resort's decidedly British heritage begins with the Majestic Georgian-style Great House, surrounded by manicured gardens and roaming peacocks-all complemented with well-heeled traditions like continental breakfast in bed, afternoon tea, and a rousing game of croquet. Minutes away on the resort's private offshore island, the mysteries of the Orient unfold in a secluded natural setting where casual poolside and beachside pleasures beckon by day, while chic parties, an authentic Thai restaurant, and island-style extravaganzas invite excitement by night. At Jamaica's most alluring resort, two diverse vacations are woven into one and served with warm island hospitality, making your stay a journey to remember. With its blissful ambience of laid-back cool and uninhibited revelry, Sandals Negril epitomizes the free-spirited personality that has long made Negril the exotic playground of choice for fun-loving pleasure seekers. Here on sands of pure white kissed by a sea of aquamarine, this decadently carefree resort is nestled within lushly landscaped acres along the island's legendary Seven-Mile Beach, putting you closer to the water than anywhere else in Negril. A love for Mother Nature ensures that Jamaica's hippest resort is also its most green - awarded an EarthCheck Double Platinum Certification for an unwavering commitment to environmental excellence for over a decade. Come let your love blossom amidst the barefoot elegance and chill-out vibe that is uniquely Sandals Negril. Sandals has designed the perfect combination of European civility and an all-beachfront tropical resort. Sandals Whitehouse is a majestic beachfront oasis within a 500-acre nature preserve. Strolling along a grand piazza lined with bistros, restaurants, cafés and bars, it's easy to forget you're in the Caribbean. Three distinctive European Villages-French, Italian and Dutch-are set along a two-mile stretch of beach where you can watch both the sunrise and sunset each day. Relax by one of three pools, including Jamaica's largest. At night, extravagant bonfire areas and firepits add to the glow of this truly unique destination in the heart of paradise. The brand new Sandals Grande Riviera – superior to other Ocho Rios resorts – has three distinctive experiences. It's a hip beach club with a chic vibe, day or night. A seaside garden paradise with babbling brooks and extraordinary ocean views. An exclusive All-Butler Village with a plantation-style Great House perched atop a mountain, where cool drinks are served with warm hospitality. A true Garden of Eden encompassing over 100 acres, this resort is so vast and lush that, no matter where you find yourself, you'll always feel as if there's plenty of space for just the two of you. All the things that make Jamaica such a uniquely spectacular destination are at the heart of Sandals Grande Riviera. Jamaica's most dramatic luxury all-inclusive resort has truly arrived. This quaint 52-room hideaway, surrounded by tropical gardens and just steps from the Hip Strip may be the smallest Sandals but it's big on charm and huge on value-with an impressive array of amenities for its size. The cozy bed & breakfast ambience of this traditional Jamaican inn is warm and captivating. In a place where everyone knows your name, the famously attentive staff also happens to deliver 24-hour complimentary room service to all guests, assuring breakfast in bed can be a favorite any time of day. Best of all, your Luxury Included® Vacation also includes exclusive "dine and play" privileges at two nearby Sandals Resorts. Like everyone who stays here, the petit Sandals Carlyle is sure to find a big place in your heart. Sandals' very first resort is a True Original. Spanning the best private beach in Montego Bay, this playful and romantic Jamaica resort is where the fun never ends and the party never stops...until you do. The casual island mood will surround and relax you. The upscale setting will impress you, especially the luxuriously private, all-butler beachfront enclave known as the Honeymoon Hideaway Beachfront Estate. But most of all, Sandals Montego Bay's warm and inviting hospitality‐where the service is incomparable and everyone knows your name and your favorite drink‐will bring you back time and again. Understated elegance and exquisitely private, this is Sandals Royal Plantation - an intimate all-butler resort of just 74 ocean view suites tucked into a magnificent coral bluff. You can spend your days lazing by the pool with cool libations delivered right to you by a beach butler. Tee off at nearby Sandals Golf & Country Club, followed by a spot of afternoon tea on the terrace. Renowned for unmatched attention to detail, this enclave of retro-chic sophistication showcases roaming peacocks and manicured lawns. This historic resort has long been a favorite hideaway for the international jet set and literary elite, with the likes of Ian Fleming and Noel Coward seeking tis casual island elegance and authentic Jamaican vibe back in their day. Today, exquisite original furnishings and new innovations - like Jamaica's only champagne and caviar bar - are designed to impress. The stately palms that grace the mile-long entrance into the legendary La Toc Estate and Golf Resort are the awe-inspiring prelude to your Saint Lucia vacation at the Caribbean's Most Glamorous Resort. Sandals Regency La Toc is recognized as the most sparkling jewel in the islands. The "Emerald of the Caribbean" glitters invitingly along the half-mile crescent shaped beach, cradling exotic coral bluffs, lush hillsides, and rolling fairways. This magnificent 210-acre estate features Sunset Bluff Village, a resort within the resort, flaunting breathtaking vistas from bluff-top villas with private intimate pools. Indulge in Five-Star Diamond French cuisine and other tantalizing cuisine from around the world at nine spectacular restaurants. Ideally located on its very own peninsula, Sandals Grande St. Lucian is often described as the "closest vacation to a picture-perfect postcard." Cradled to the west by Rodney Bay - boasting the calmest waters in all of Saint Lucia - and to the east by the majestic Atlantic Ocean, this magnificent resort showcases awe-inspiring panoramic views that will linger in your heart forever. Volcanic mountains draped in blankets of green rise majestically from an impossibly clear blue sea. A sheltered mile-long beach extends an open invitation for days of endless water play. This is paradise as it was meant to be, full of natural beauty, rich in history, and resplendent in pure romance. If ever there was a resort that embraces the quintessential Caribbean, Sandals Halcyon Beach is surely it. Here in the midst of a tropical utopia, where majestic palms line a pristine beach and verdant mountains rise from a turquoise sea, you'll discover a charming and intimate sanctuary that's the essence of its name...tranquil, peaceful and calm. This is a true Garden of Eden, a place where your senses are elevated into overdrive by caressing sea breezes, inviting ocean waters, and fragrant tropical blooms. Experience pampering with an exemplary level of refined service, and surrender to a world of enchanting temptations that immerse you in the hypnotic realm of the islands. 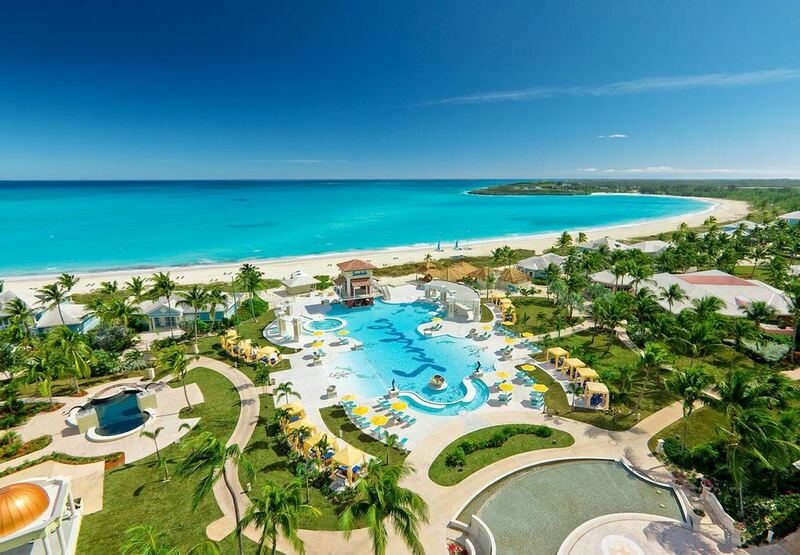 Deep within the idyllic waters of the Exumas, Sandals Emerald Bay brings unprecedented luxury to the easy-going rhythms of the Bahamian Out Islands. This luxury Bahamas resort is a privileged enclave, designed to ensure you'll feel like you're the only ones there, where service reigns supreme and Bahamian-style architecture of elegant villas and suites harmonize with nature. Secluded within 500 tropical acres along a pristine, mile-long beach, civilized pleasure coexists with exotic adventures, from three impressive pools - including a half-acre, zero-entry pool with a dramatic fire pit in the middle - to seven exceptional restaurants. Voted the "World's Most Romantic Resort", year after year, Sandals Grande Antigua offers you the best of two worlds-the authentic Caribbean and the stylish Mediterranean-in one legendary all-inclusive vacation. Set on Antigua's best and most famous beach, Dickenson Bay, the resort's charming seaside garden oasis known as the Caribbean Grove is graced by meandering pathways, majestic palms and cooling Trade winds. Then step into a realm of chic sophistication where European grandeur unfolds from the hillside to villas-by-the-sea at the Six-Star, all-suite Mediterranean Village. At Sandals Grande Antigua, it is said a flower blooms suddenly with every kiss. Create your own lover's legend as you share the most romantic holiday of a lifetime. Two perfect worlds. One grand resort. All included. Defying every convention of traditional design, the new Sandals LaSource Grenada takes innovation beyond the realm of imagination to create an extraordinary resort unlike anything you have ever experienced. Pools in the sky and living rooms in swimming pools. Private plunge pools, cascading waterfalls and meandering river pools. Here, in the heart of Grenada's exclusive Pink Gin Beach, on an exotic island paradise where the intoxicating scents of spice and tropical blooms make a heady elixir for romance, we've taken the best of everything to create a whole new Sandals experience... one that takes you beyond the unexpected.